We use environmentally friendly 4-stroke outboard motors to significantly reduce outboard emissions. We also collect all aluminum cans at our resort and donate them to a local environmental group called Clean North. We ship all our garbage off of the lake to be disposed properly at a licensed waste disposal site. We keep a significant library on the local flora and fauna to help educate any of our guests who are interested in studying ecosystems, the environment, and the impact of human activity on them. Our mandate is fishing is a sport, a recreation and a responsibility. Eating fish, catching lots of fish, and catching the “Big One!” are all part of great fishing vacations but so is insuring that future fishing is as good, or better, for future generations of anglers as we enjoy now. 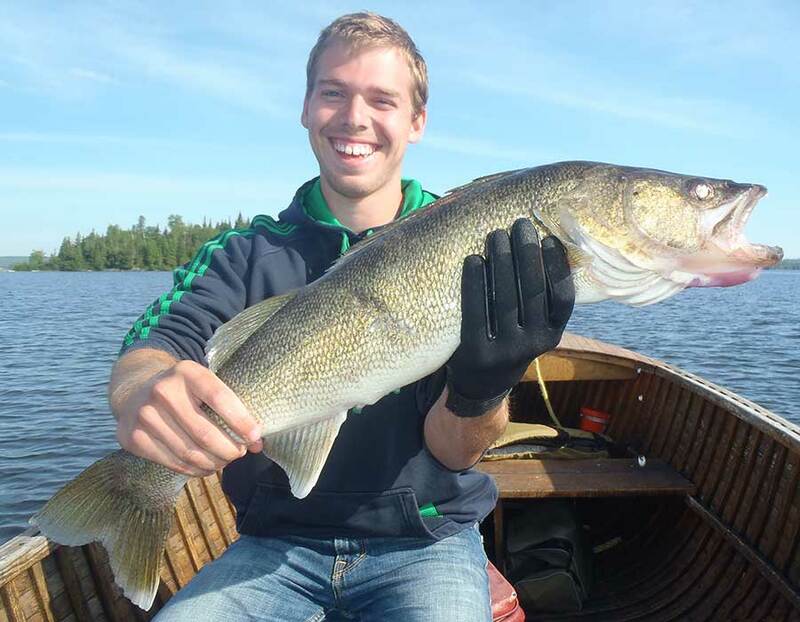 We encourage our guests to release all large spawning size fish: walleye over 20 inches, northern pike over 30 inches and perch over 12 inches. These fish are generally all females, prime spawners and at least 10 years old, while really large fish can be 30 years old or more. If a guest is interested in a trophy mount, trophy fish replicas are a good choice and last indefinitely. The material that trophy fish replicas are made of is designed to be painted with the same skin and scales resembling a real fish. The skill of a fish taxidermist is dependent on their skill as an artist. All that is needed to create a replica fish mount is the measurements of length and girth, and a high-quality photograph. We also believe that the best trophy of a great fishing vacation is a great photo to display on the wall. Digital cameras and many of today’s cell phones are perfect for capturing your fishing and vacation moments. At the resort, we will print 8×10 photos of the trophy fish caught and released by our guests free of charge. We encourage our guests to enjoy eating fish here, when the fish is at its freshest. A shore lunch of fresh fish cooked over an open fire is delicious. The best eating size fish are: walleye 15 – 18 inches, perch 9 – 12 inches and northern pike 22 – 28 inches. If you want to take fish home, we recommend that guests eat the fish within 2 to 4 weeks of returning home. This ensures the quality of freshness and taste. If guests do not plan to eat their fish in that 4-week time frame, we suggest catch and release of all fish for their next vacation. We compost all food waste from the lodge and the entire resort. Our composters of choice are the black bears as they accept any type of food waste. Fruits, vegetables, egg shells, meat and bones are all consumed with equal enthusiasm. This strategy ensures food waste does not attract bears to our island. Please put all food waste into the containers provided. When full, leave the container on your dock before 1:00 pm. The container will be collected and clean container will be left at your cabin. Please ensure that trash items are not included with food waste. Our composters reject them and this makes a mess. It’s important to know that we put in a lot of effort to ensure our black bear neighbours do not become friendly to humans. When food waste is brought to the black bears, it’s in a controlled and deliberate manner to ensure the black bears do not lose any of their innate caution of people. Please do not throw any food to bears from the boats. Black bears become “too friendly” too quickly.